Ideal for Switching DVI Single & Dual Link, HDMI, RGB–HV, Digital Video, SDI, HD–SDI, 3G HD–SDI and All Future Standards Up to 10 Gbps. MultiDyne Video & Fiber Optic Systems, a premier provider of fiber optic–based video and audio transport and routing solutions for broadcast and pro A/V applications, debuted its EOS–4000 Series fiber–optic switchers now available with SMPTE 3G HD–SDI Re–Clocking Input/Output Blades at IBC 2009 (Stand 2.A54). When combined with the MultiDyne SilverBULLET, HD–1500 or HD–3000, the EOS–4000 3G SMPTE video electro–optical routing solution provides a complete routing and long–haul distribution system for broadcast, medical, government and pro a/v applications. In addition, the EOS–4000 transparent, non–blocking solution is inherently “future–proof,” with scalable size and bandwidth for all future standards up to 10G. 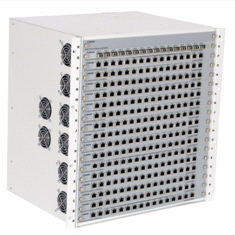 When using SMPTE SFP optics, the EOS–4000 switchers are also fully SMPTE compliant. The bandwidth through SFP ports is 4.25 Gbps, with up to 10 Gbps via XFP. New features for the EOS–4000 series include SMPTE 3G HD–SDI re–clocking input/output blades. The EOS–4000’s standard input and output blades are a multirate device design for general purpose switching, including composite video using the DVM–2000 Series or for DVI–RGB with the MultiDyne flagship DVI–6000 solution. However, as special attention must be paid to signal processing and management for in–demand 3G HD–SDI video applications, combining the EOS–4000 with the new EOS–16PORTSFP–3G 16 port, SFP, SMPTE 3G Re–Clocked I/O Blade achieves optimal performance and compliance. This solution, which requires SMPTE compliant SFP modules, provides 16 re–clocked optical outputs exceeding SMPTE jitter and pathological specifications. MultiDyne also provides the SFP–1310–SM–10K–3G family of 3G SMPTE video SFPs to ensure users can meet this requirement. Blades are scalable in increments of 16 ports, and scalable 10 Gbps XFP I/O blades for future migration to 10 Gbps include 4 XFP ports per blade. The new enterprise version of the EOS–4000 includes new monitoring software, an embedded web GUI that controls switches remotely from a web browser over a network and utilizes SSL for security. The software gives the user the ability to monitor the switcher input sources separately from the output destinations. This feature is very important in many broadcast and professional audiovisual applications. The EOS–4000 series of switchers also support Crestron and AMX control systems. The EOS–4000 Series devices provide high–speed switching between ports, and are designed to function as incredibly versatile, multi–purpose solutions crucial for any distribution system. They are an ideal solution for routing DVI single and dual link, HDMI, RGB–HV, SDI, HD–SDI and 3G HD–SDI signals optically. As electrical routing switchers for high bandwidth signals do not currently exist in the market in any scalable size, electro–optical switchers are a welcome alternative. The EOS–4000 switches in the light domain, functioning as a natural solution for users who need to transport high bandwidth video over longer distance. It can also switch many different formats of video, HD and audio, eliminating the need for additional switchers while maintaining signal integrity, security and quality.